Florence is the queen city of restaurants. There are literally hundreds of them, from quaint to elegant. From simple to gourmet. From traditional to nouvelle. Tourists pack the restaurants every night of the week, and all will gladly relive their favorites with you. But where can you find great traditional food at local prices? This is the real question. And with this question, the field narrows. “It’s easy to find a good meal. The trick is to have a second good meal at the same place,” so goes the local saying. 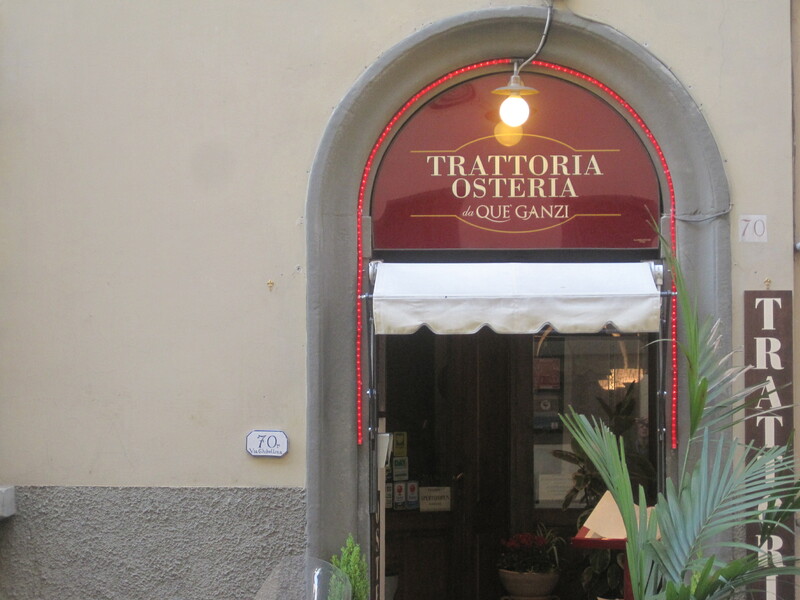 A couple of weeks ago, we followed some reviews and arrived at the doorstep of the Trattoria-Osteria da Que’ Ganzi on via Ghibellina. Today, we’re here to follow up, after our second dinner there. Oh, it’s easy to ask for Za-Za’s, or Mario’s or Leo’s. Those are generally thought of as easy enough names, but Que’ Ganzi? What’s that? Who is that? What does it mean? We asked. Que’ is an abbreviation for quei, those. Ganzo is an adjective that means out of the ordinary, something special. So Que’ Ganzi means “those extraordinaries.” (The i at the end makes it plural.) Let’s just say it lives up to its unique name. 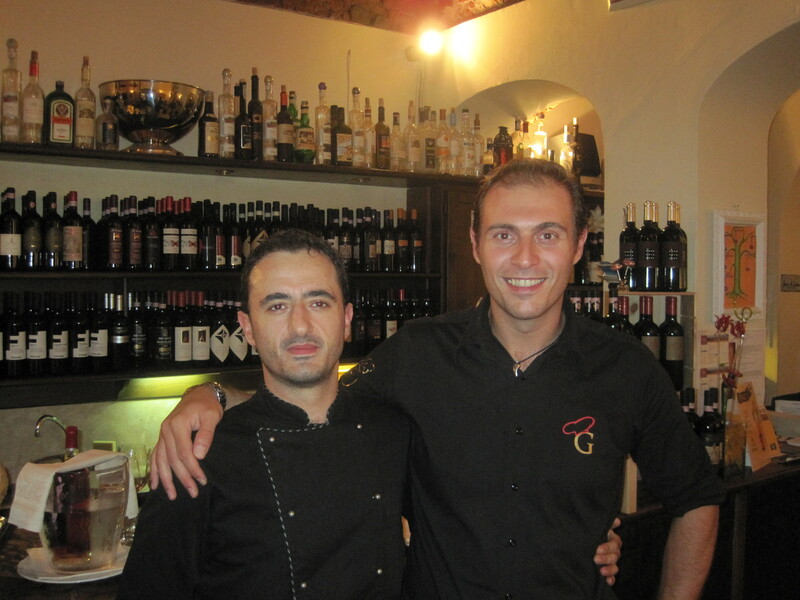 The restaurant is owned and run by two friends, Domenico, who manages the dining room, and Matteo, the chef. Each is completely perfect for his chosen location. Matteo creates dishes that are traditional, but with a flair. One of my favorite main courses is peposo, which is a rich beef stew, but without any vegetables. I was going to take a photo, the plate was so beautiful, but my appetite won and I carelessly forgot to snap any pictures. 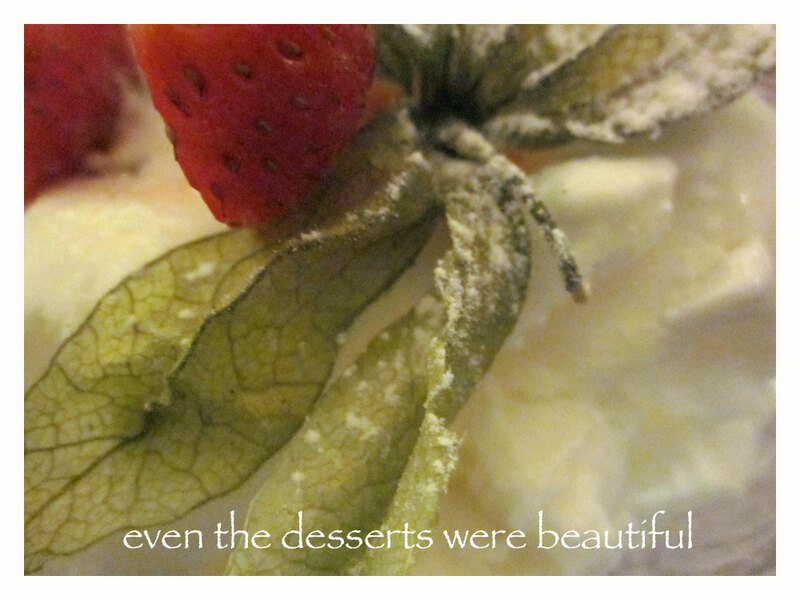 But it was delicious, in addition to being beautiful. Tender chunks of beef were arranged in the center of the plate, which was decorated with tiny tomato slices alternated with pesto dots. The beef was tasty, punctuated with black peppercorns, as is the classic recipe. Em enjoyed a large vegetarian plate that boasted grilled slices of eggplant, radicchio, zucchini and was nicely balanced with some melty smoked provolone cheese. 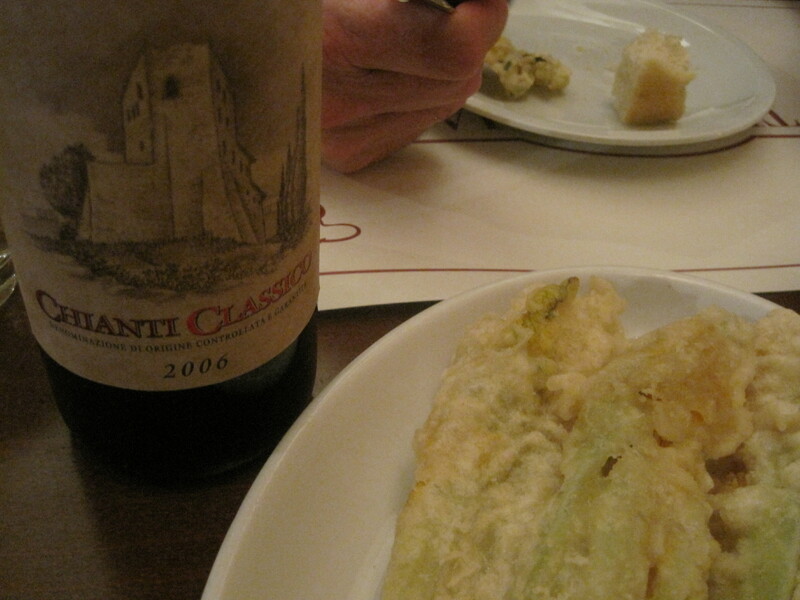 We shared a contorno, a side dish, of fiori di zucchini fritti, fried zucchini flowers. I’m not exaggerating when I say that each one was nearly the size of my hand. They were battered in a special mixture of farina di ceci, garbanza flour, which makes them light, and slightly sweet. They are so delicious that, to be honest, we also had them the first time we ate there. As Domenico walked by to check on us, all we could do was nod and mumble with our mouths stuffed. But we’re sure he got the idea that we were completely happy with our flowers. We’re not normally dessert eaters, but Domenico recommended one of their five homemade specialties. 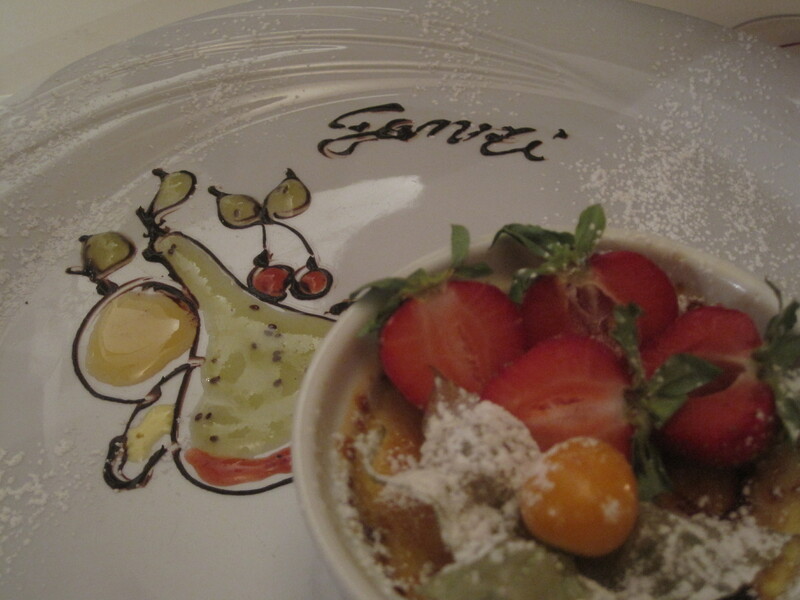 We know that it’s not really Italian, but nevertheless, we ordered the crème brûlée, which was the perfect ending to the meal. Oh, wait. Dessert isn’t the end. I forgot. After dessert we each had a caffè macchiato, an espresso with milk. Then Domenico served us an after dinner drink—a digestivo. You know, we always want that little something extra to ease the process of digestion. There’s no doubt that we have found a trattoria-osteria that defies that old saying. We did find a second great meal there. In fact, we are already looking forward to our third meal at da Que’ Ganzi. Don’t tell too many of your friends about it because we want to keep it as our own little secret. 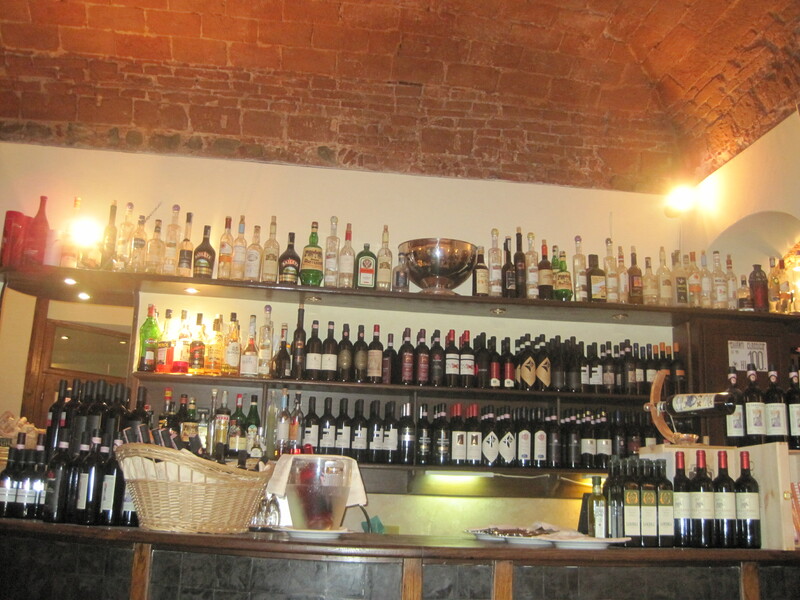 I am traveling to Florence in September, 2012 and while searching for restaurants and reviews, I came across this one. I will be making a reservation ahead of time. Just for the simple fact that my name is Lisa Ganzi and I have to try the food here. Especially the Zucchini Flowers!. Thanks for posting the review. What a wonderful last name you have! Matteo runs the kitchen and is awesome! Domenico manages everything out front and is delightful as well. Please tell them Cheryl and Emerson sent you. And, let us know what you think!